is there a cheap (<$150, probably chinese, or used?) 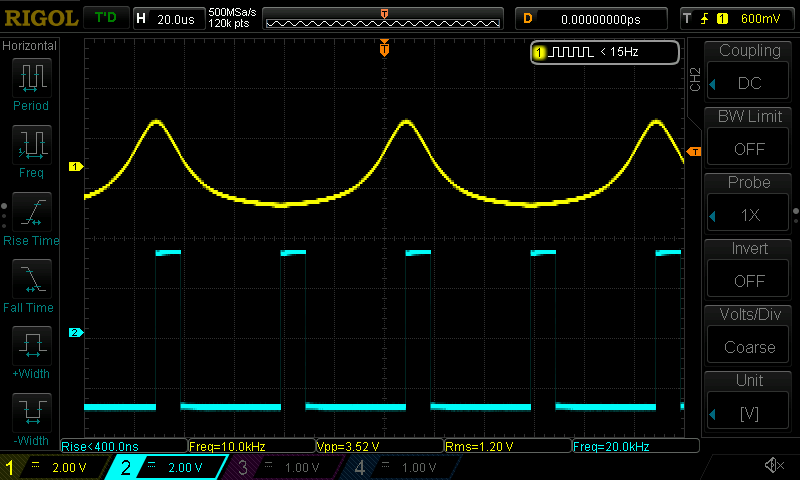 signal generator which has variable square wave rise/fall time? I would really appreciate any tips. What speeds and rise times do you want? What duty cycle requirement? What voltage level? Your question is so generic it's hard to answer. One option is a low pass filter on the output with a corner frequency set at some multiple of the square wave fundamental. Another option would be to feed a ramp to an MCU DAC. 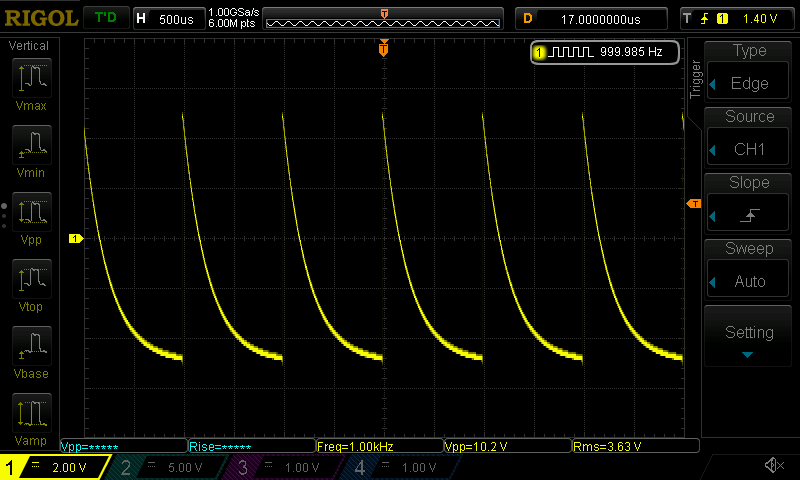 That would be really cheap and easy if you don't need more than 3-5 V output. Most low cost arbitrary waveform generators should do what you want though they might be painful to program from the little reading I've done. HP 8012A/B and Wavetek 801 come to mind. Thanks, HP 8012 is a good recommendation. I'll watch out for those. Any other tips? @rhb 3-5Vpp is fine. A variable rise/fall time between maybe 15ns and 500ms. Watch out for the sliders on the 8012’s. They tend to die and are irreplaceable. Nice little boxes when they do work. Any of the ARM dev boards should give you what you're looking for. If you don't mind a USB dongle with a terminal as the control, Mecrisp forth with one of the many boards it supports would be especially easy to program. There are so many cheap OEM dev boards now I can't keep up. I know I've got some with 16 bit DACs, but can't remember which. I know that there is a 16 bit audio DAC for the Teensy. I've got one, but haven't messed with it because of some software issue which I've forgotten. I have a (very) low cost (Feeltech FY3224 AWG -as little as $45 now) and one can use CSV file to generate custom waveforms. You need to write out a CSV file containing one complete cycle of the wave form and then load it. This would be less convenient than what you might be able to dial up with a better AWG but really cheap, and still quite usable. Also, it would be scriptable so would lend itself to all sorts of automation. The software it comes with is for PCs but it runs fine under Wine. Also, there are Python tools so it can be used under any platform natively. You speak to it via a USB UART adapter it has internally. So, that means you can loop through any arbitrary values in scripts. I've also attached a file that contains the communications specification. All this probably also applies to the newer version. Otherwise you could zap your devices under test. Basically you need to attach a good ground to it and make sure it stays attached. Thats a small price to pay though. I've found the feeltech to be very useful. For `w/f/d/a` if the control is already focused, it focuses its counterpart in the other channel. Thank you! That's very useful as it's a easy way to load a saved scope trace into the AWG. I'd have never looked at one of those. 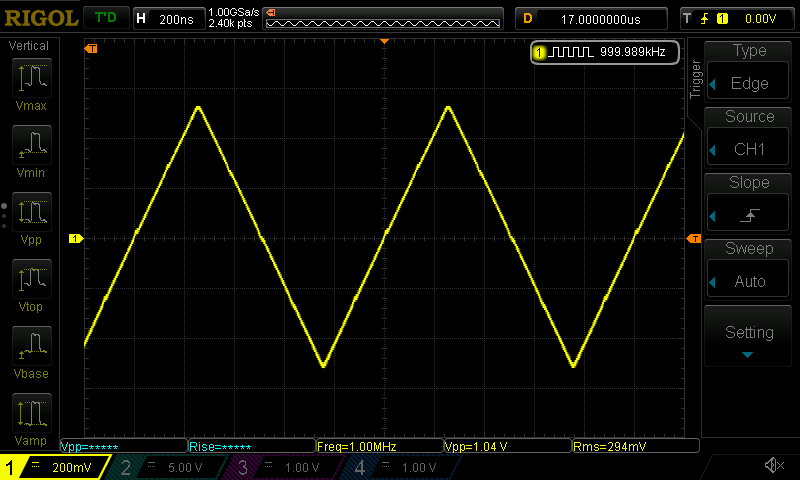 I am going to upload an example of an arbitrary waveform file that I found somewhere (probably here in the big Feeltech thread) this is 10 cycles of a sine wave. This is an xls file, actually, and will give you an example of the file format.